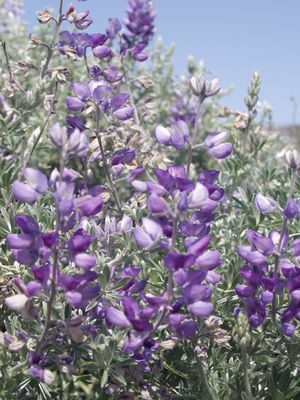 This lupine is native to dunes and bluffs along the California coast from Marin County south to Los Angeles County. 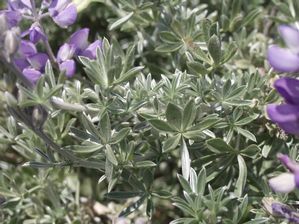 It has beautiful gray-green foliage which is covered in soft silvery hairs that make the plant glisten in the sunlight. The flower spikes can be up to 8" long and range in color from light or medium blue to lavender. 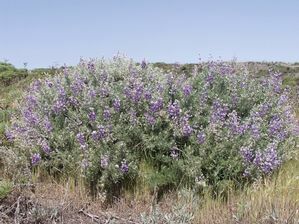 The plant's size is variable; it can range in height from 2' up to 7' and can grow from 3'-6' wide. The extremes of size are relatively rare, however, and it usually stays in the 2-3' range.